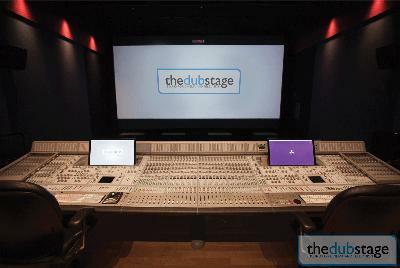 The Dub Stage, one of the top audio post-production facilities in Hollywood, has chosen QSC Q-Sys to support its audio signal processing and routing. Q-Sys is a complete digital audio network and processing platform that allows complete flexibility and control of complex audio systems. Originally developed for sophisticated commercial audio installations, Q-Sys can be scaled up or down to cost-effectively accommodate systems of almost any size, including 5.1, 7.1, 11.1, 13.1 and MDA (Multi-Dimensional Audio) cinema audio formats. While the new immersive cinema sound formats have expanded the palette for sound designers and mixers, they have also significantly increased the complexity of the post-production environment. Just a few years ago most films were mixed only in either 5.1 or 7.1 formats. Today, as the digital cinema transition is nearing completion, the options for surround formats now include Barco Auro 11.1, 13.1, as well as MDA object-based sound, which potentially allows up to 128 separate audio signals and any number of loudspeakers. Managing the different formats and the multitude of loudspeaker configurations is a complicated task. QSys provides a vast library of DSP-based signal processing tools, including equalizers, limiters, delay, and phase correction. In addition, Q-Sys allows the system designer to build a virtual matrix mixer/switcher, to route any number of input signals to any or all outputs. All of these functions are accomplished in only a few rack spaces, significantly reducing precious space and installation costs. Q-Sys systems are comprised of a central processing Core, Designer software for configuring systems, the Q-LAN network, and peripherals such as input/output (I/O) frames and a variety of cards and touch screen controllers. Using Q-Sys Designer software, a system designer can create a totally customized, applicationspecific system for any post-production facility or cinema complex to integrate with existing B-chain components. The Dub Stage is equipped with the Q-Sys Core 500i to control all 37 loudspeakers in the 1500 square foot room as well as a separate near-field system. The Core 500i is loaded with four AES3 digital audio input/output cards, which accept 32 inputs from the studio’s Pro Tools mixing/editing digital audio workstation. Seven AES3 outputs are then routed to Left, Center Right, Left-height, Center-height, and Right-height screen channel signal processing and powered loudspeakers, as well as a low frequency extension channel for subwoofers. Three I/O frames control level, delay, bass management and equalization for the 24 surround speakers and subwoofers. Additional I/O channels and surround speakers are in the process of being added and Q-Sys is ready to expand as the stage is upgraded. “We use Q-Sys to manage complex monitoring of the latest surround formats, especially Barco Auro 11.1, 13.1, and the newest MDA object-based format,” says Marti D. Humphrey CAS, President/ Re-Recording Mixer at The Dub Stage. “This allows us to address any one of our loudspeakers individually with adjustments to eq, time delay, and bass management of the surrounds, along with muting, metering and calibrated levels. Even with all this processing, there’s still tons of processing power for any formats that will ever be dreamed of in the future. But the sound quality, first and foremost, is the difference with Q-Sys. It’s like a blanket that has been lifted off my sound system,” says Humphrey. Q-Sys is part of the new line of QSC Premier Cinema Sound Systems, which include all signal processing, amplification, and loudspeakers for critical sound mixing and presentation.